We build art libraries in our minds one image at a time. The more art we see, the more comprehensive our library may become. Whether that library gets trapped within a narrow and rigid shelving or gathers flowers from many gardens is pretty much up to each one of us. My artist friend Nat Leeb had astonishing visual recall: he could remember virtually every work of art he saw, either face to face or in a book or periodical. Seemingly, these images entered his brain in a flood; in reality they entered one at a time, over decades of looking and pondering. Another friend, the late Dr. Joseph Smith, a psychiatrist and attorney, could remember and recite anything he read, whether it was Dylan Thomas’s long recounting of “A Child’s Christmas in Wales” or Robert Service’s “The Shooting of Dan McGrew.” That ability used to irritate me — jealously, you know. I don't have the kind of visual gift that can recall the details of pictures I’ve seen — I couldn’t sketch them from memory. What I can remember are the circumstances that led to many of my visual discoveries. Previously I have related that the only art I saw growing up was a lousy reproduction of Millet's Gleaners that hung in my grammar school classrooms. The first big-time original art I ever saw was in the California and International art exhibitions in the San Francisco World’s Fair in 1939. I was 13; I saw the art, cannot remember anything specific about it. But I do know when I saw my first big-time paintings whose images and identities stuck with me. On the second Thursday in March, 1944, at lunchtime I dropped out of high school in Carson City, Nevada. Watched by my parents and my four best friends (who were going to be late getting back to school), I boarded an overnight bus to Los Angeles to enlist in the United States Army. I was 17. The bus arrived at the Pacific Electric Station at Sixth and Main in Los Angeles very early in the morning. I watched thousands of wartime commuters passing through the station until the recruiting office opened upstairs in the same building. I spent most of Friday going through pre-induction formalities, including physicals with several hundred draftees. Since I could not be sworn in as a volunteer until all the paperwork was completed, I had to return Monday morning. Thus, 13 March, 1944, became one of those most important dates in my life. That was 70 years ago. Nearly everything I have done since that day has been an outgrowth in some way of that enlistment, including meeting Frances seven years later and marrying her a year after that. I think this column will appear on Monday, 10 March — close enough to celebrate that important day seven decades ago. I was sent to the Army Specialized Training Program unit which had taken over the entire West Campus (formerly Muir Tech) of Pasadena Junior College. A few weeks before I arrived, there had been hundreds of soldiers there studying engineering, with a faculty of nearly 50, but the Army was gearing up for D-Day, and almost all of those GI students had been called back to the infantry. There were now only 45 of us in that sprawling campus, only 11 of us in the first term. On a Sunday afternoon, probably in April, one of my new 10 friends suggested that several of us visit the Huntington Library in nearby San Marino. I agreed, although I had no idea what the Huntington Library was. That afternoon my eyes must have bulged as I encountered for the first time in my life two meta-famous paintings whose I identity and location I would never forget. This was the real start of my art awareness — my brain's art library. 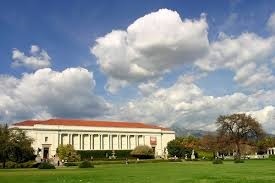 The full name of the place is The Huntington Library, Art Collection, and Botanical Gardens. The mansion originally was the home of Henry E. Huntington. Henry Huntington made a fortune in railroading and California real estate. He worked for his uncle, Collis P. Huntington, one of the Big Four who built the Central Pacific (renamed the Southern Pacific) Railroad. After Collis died, Henry took over management of Newport News and Drydock Company in Virginia and married Collis's widow, Arabella. In 1898, Henry purchased the narrow-gauge Los Angeles Railway and converted it to the standard-gauge Pacific Electric Railway, which would grow to a vibrant system of 20 streetcar lines, 1,300 miles of track, and 1,250 trolleys. As I admired the literary treasures of the Huntington Library, looked at the art collection, and walked in the gardens, I had no idea that Huntington was the business genius behind the Pacific Electric Station, where I had enlisted in the Army, or the “Red Car” trolley system that was carrying me so often between my school in Pasadena, my dates with a very important girl who lived in Alhambra but went to college northwest of Hollywood, and various spots in Los Angeles where we went together on my weekend passes. 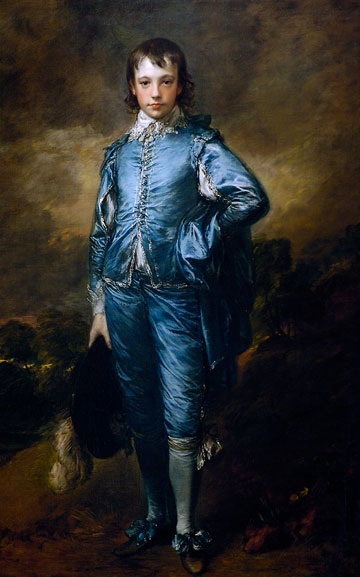 Blueboy by Thomas Gainsborough (1727-1788), ca. 1770. 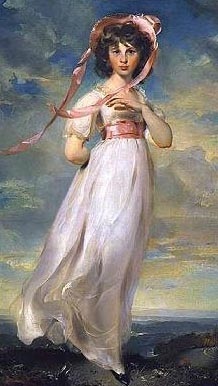 Pinkie by Thomas Lawrence (1769-1830), ca. 1794. Since then I have seen thousands of paintings I liked better.